I have a big goal in 2018 … which is to start earning significant side income. You may be wondering … “what do I consider significant side income?”. Basically, I want to eventually earn the same amount of income from side hustles as I do from my full-time job (or W2 income as I like to call it). I want to be able to “replace” our income from my job (if needed) with various side hustles. This would give us the power and flexibility to push our family one step closer to financial independence. It is also important to point out that even though we would like to match our W2 income with side hustles … it doesn’t necessarily mean I would quit my job. It just gives us power to make that change if we wanted to. One side hustle that I would like to grow and earn income from this year is from a niche blog we started about 3 years ago. Based on the success of other bloggers and our traffic results from the past 2 months, I am encouraged about the potential to earn blogging income as a side hustle. To be clear, we haven’t actually earned any side income yet from our blogs. At this point, we have two main blogs … one of which is this site The Money Sprout. This is where we discuss things like investing in dividend stocks, living well below our means, building side hustles, and reaching financial independence. When it comes to writing and blogging, I have two strong passions – personal finance and health and fitness. I handle the personal finance topics here on The Money Sprout. For covering health and fitness topics … I started a separate blog for that over 3 years ago. For years, I never gave the health and fitness blog much love … only posting every couple of months. I didn’t have any plan or purpose for the site and treated it more like a hobby. But now my focus has changed from blogging as a hobby to blogging as a source of side income. Since launching that site … visitors to the health and fitness blog have been limited and there have been no earnings. So in order to stay on track, I have been providing monthly updates on our progress … so here are the updates from December (2017). After an incredible month for pageviews in November, we validated that in December by posting our second biggest traffic month ever. Our goal is to consistently drive 100,000+ pageviews per month to the site by this June. That should open up a lot of potential income streams to the site so that we can work towards earning $5,000 of side income per month. You may be wondering … why so much growth the past 2 months? Almost all of those pageviews came from the growth of my site’s Pinterest account. I have not been actively posting new content to this site, but I have been growing it’s Pinterest account. And as a result, our pageview growth exploded. Just for reference, prior to November, we had 4,192 pageviews in October and only 1,914 in September. So as you can tell, Pinterest has been a huge traffic boost to the site. 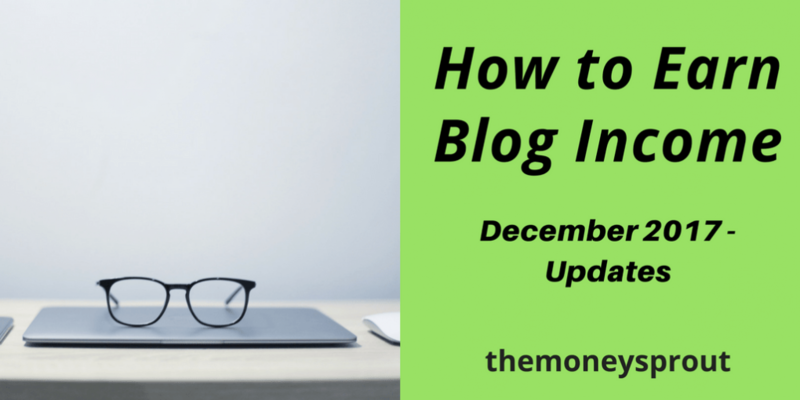 And even though I didn’t work too much on the blog directly last month … we continued to grow our Pinterest account in December which kept the traffic coming in. As far as other social media accounts … I didn’t do very much to grow our Twitter account in December and even less with Instagram. The results speak for themselves as we kept the same number of Twitter followers and dropped one Instagram follower. For now … it is all about mastering Pinterest as that gives us the biggest return. Blogging Income Results for December – How did we do? We didn’t spend any time (again) on publishing new content on the site. However, that doesn’t mean it wasn’t a successful month. In fact … the results from the past 2 months have really given me a good feeling we may be on to something that is sustainable. Our long term goal is to earn $5,000 per month in sustainable income by June 2018. Not sure we are going to hit that target at this point as there is a ton of work that will need to be done over the next 6+ months. Once again, this didn’t happen and no new content was published on the niche site. Unfortunately, this has become a pattern recently … so I need to take action as soon as possible. I plan to keep this goal the same for January and just start writing. The good news is that our family is starting the Paleo diet this week … so I should get some inspiration from my own life to start writing. I was able to hit this goal for 80% of the month. The holiday’s ended up taking more time out of my schedule than I previously planned, so the last couple of days I didn’t post new pins. For the most part, I have a good handle on keeping this schedule and shouldn’t have an issue committing to it in January. This has been the #1 reason for the growth in traffic to my site … so it is important to keep it going. I have been getting carried away with setting goals on publishing new posts. So in January, I want to try and set a goal that will be sustainable. At the same time, I want to continue growing our Pinterest account so we can push past 35,000+ pageviews and hit 100,000 by summer! One last thing … for several months I had been posting that I couldn’t seem to get any email subscribers. Well in November and December we got several, so I plan to start up a weekly newsletter this month too. And of course the goal is to continue growing our subscriber list in January. After seeing our pageviews explode the last two months, I am very encouraged about getting traffic to our niche site. As long as I can dedicate time to producing new content on the site, I know Pinterest can drive traffic to the blog. I just gotta step up and quit making excuses and take action by publishing new content. From there … it will be a matter of building that precious email list and further down the road monetizing it. Now that I have narrowed down my monthly goals to just a few, I should be able to stay on track and start building this site.